Villa ideally situated in first sea front row, 50m off the coast with panoramic ocean views, comfortable and in perfect condition. Large kitchen, living room, 2 bathrooms. Large terrace with panoramic views of the coast. Air conditioning (hot and cold). Very quiet in all seasons. Very complete equipment (dishwasher, washing machine). Sleeping high comfort (Tempur). Cable and satellite TY (Astra and Eutelsat) receiving a multitude of international channels and all unencrypted French channels. Air conditioning (hot or cold). Barbecue. Linen provided. Cleaning and change of towels included in the price. Three pools of sea water including one of 12m x 5.50m which is heated and covered in cool season (open from 01/01 to 31/12) and one of 30m. Possibility of daily aqua aerobics conducted by a highly qualified professional (extra charge).Small bath for children. Children's playground. Childcare. 3 tennis. Car park. Wide lawns, flowers in all seasons. Shops and restaurants in the immediate area. Grocers and mini supermarket 100 m, supermarket 700 m, restaurant 50 m, sandy beach 100 m, golf course 6 km. Shuttle to Armação de Pera (2km). Reception 24h / 24h. Arrivals and departures are scheduled on Saturdays. If your dates are flexible, it is better taken into account. When a stay begins and / or ends another week day, a price increase may be applied. Please ask us. A refundable Faithfull deposit of 30% (with a minimum of € 150 and a maximum of € 750) must be paid along with the balance of the stay, at the latest 35 days before the start of stay. Unless serious incident of stay, the deposit will be refunded at end of stay. If the deposit is paid by check, it will be returned at departure without having been cashed. Discounts from the 4th week (from the 3rd week in case of renewal of stay). We had a really enjoyable week at this villa despite the weather not being perfect. It is just as described with everything you might want. It is in a fabulous position very close to steps down to the beautiful beaches, tennis court and pools but with an expanse of green lawn right outside. The roof terrace is a great sun trap. Nice walks left or right along the cliff tops and nice restaurants and bars within walking distance. You can choose to be away from it all or at the centre of things, depending on how you feel. Thank you, Katherine, for expressing your satisfaction so clearly. It is a pleasure to read how you enjoyed the attractive sides of this relaxing exotic holiday resort and of the villa in which you have stayed. We have chosen and arranged it for our own comfort and we are very happy to share all the benefits with the sympathetic families we host. I appreciated the punctual and most enjoyable communication with you. You will be welcome when you want to come again, and for this next time... I “promise” more sun because the cooler spring this year was really uncommon. "Really beautiful place to stay.Well equipped, spacious and in perfect condition. 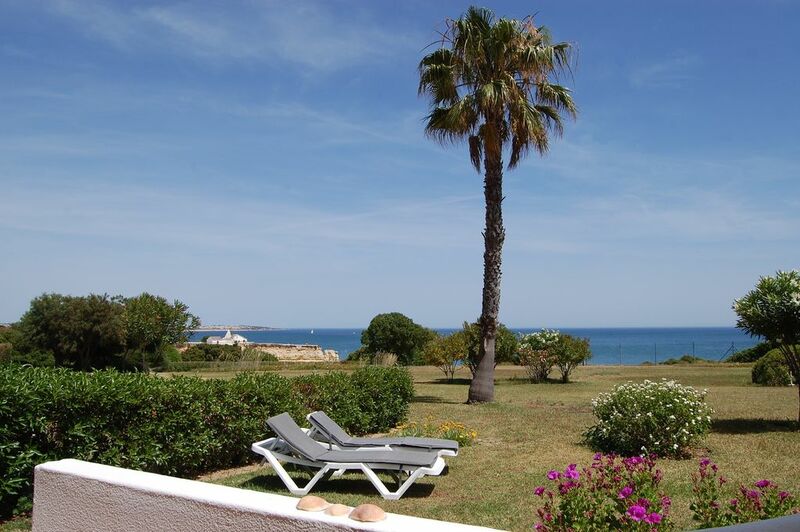 Nice and quite area, a peacefull private roof terrace overlooking the ocean. The beach is just 5 minutes walking, cleaned and free pool area. Fantastic walks along the coast just out of the door......! La casa è perfetta, pulita, spaziosa e in posizione ottima; zona tranquilla a due passi dalla spiaggia e dalle piscine. A beautiful place to stay.Well equipped,well maintained,spacious. Would be comfortable for up to 4 or 5.Private roof terrace overlooking the ocean. Small beach nearby. Great walks along the coast.Fantastic! Sehr schönes Ferienhaus. Tolle Lage. Sehr gute Ausstattung mit Geräten von hoher Qualität und Funktion. Hervorragende Lage mit Blick auf Palmen und Meer. Tolle Anlage mit hilfsbereitem Personal an Rezeption und im Restaurant, sowie hervorragender Haus-Service. Hallenbad hat uns auch im Februar das Schwimmen ermöglicht. Ich freue mich über Ihre Zufriedenheit. Genau dieses Ziel verfolgen wir: die Familien, die uns bei der Wahl unserer Villa vertrauen, voll zufrieden zu stellen. Das Meer und die Pools erwarten Sie ... Sie sind herzlich willkommen, wenn Sie wiederkommen möchten! Appartement chaleureux, clair et fonctionnel dans une residence parfaitement entretenue. On s'y sent comme chez soi!!! La situation géographique est idéale pour explorer aussi bien l'est que l'ouest de l'Algarve.Magnifiques promenades le long des côtes..
Propriétaire disponible et charmant, qui répond a la moindre demande. Moi et ma famille y retournerons avec plaisir lors d'un futur séjour. In the close neighbourhood: thalassotherapy, facials and body relaxation (Vilalara, Vila Vita), magnificent golf courses of international reputation, excursions, sailing, water sports, fishing, horse riding, tennis, beautiful landscapes on the coast (sandy beaches, ochre cliffs) or in the hinterland (vineyards, almonds blossom, orange trees, lemon trees), cinemas, cultural sites, parks, water attractions (The Big One, Slide and Splash, Zoo Navy), scuba diving, great shopping facilities, numerous restaurants, etc. Numerous tips and instructions are provided before departure as well as information on opportunities for local discoveries. Further details await the visitor to the villa. Dates des séjours : Les arrivées et les départs sont prévus le samedi. Si vos dates sont flexibles, il est mieux d’en tenir compte. Quand un séjour commence et / ou se termine un autre jour de la semaine, une majoration de prix peut être appliquée. Veuillez nous consulter. Dates of stays: Arrivals and departures are scheduled on Saturdays. If your dates are flexible, it is better taken into account. When a stay begins and / or ends another week day, a price increase may be applied. Please ask us. Caution : La caution doit être payée en même temps que le solde du prix du séjour (au plus tard 35 jours avant le début du séjour). Sauf incident grave de séjour, la caution sera remboursée en fin de séjour. Si la caution est versée par chèque, il sera renvoyé en fin de séjour sans avoir été encaissé. Faithfull deposit : The Faithfull deposit must be paid along with the balance of the stay (latest 35 days before the start of stay). Unless serious incident of stay, the deposit will be refunded at end of stay. If the deposit is paid by check, it will be returned without having been cashed. Réductions Tarif dégressif à partir de la 4ème semaine (à partir de la 3ème semaine en cas de renouvellement de séjour). Discounts Discounts from the 4th week (from the 3rd week in case of renewal of stay).